Every January through March, vast numbers of small fires spring up across the countryside in Southeast Asia. Those months usually bring cool, dry weather—perfect conditions for burning. On that day, there were significantly more fires in Cambodia than in neighboring countries. 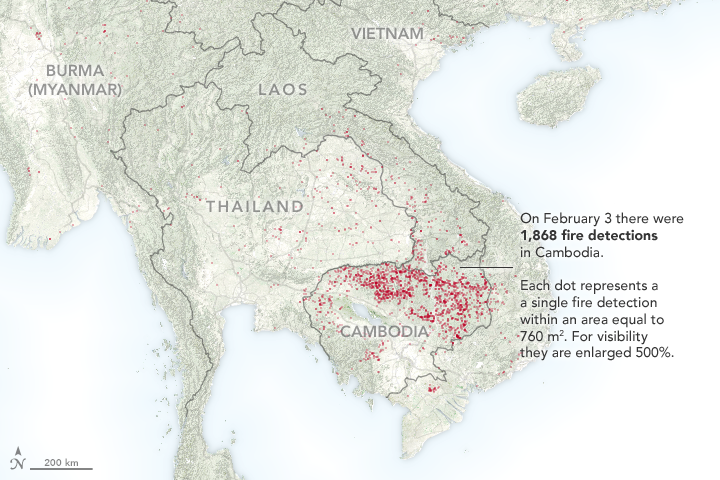 VIIRS detected 1,868 hot spots in Cambodia, 185 in Laos, 77 in Myanmar, 217 in Thailand, and 114 in Vietnam. 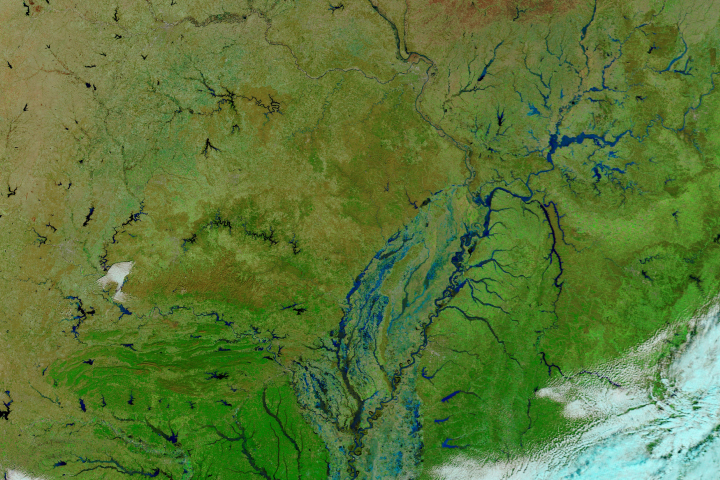 The large number of fires in Cambodia were the most VIIRS has observed on a single day in 2018. 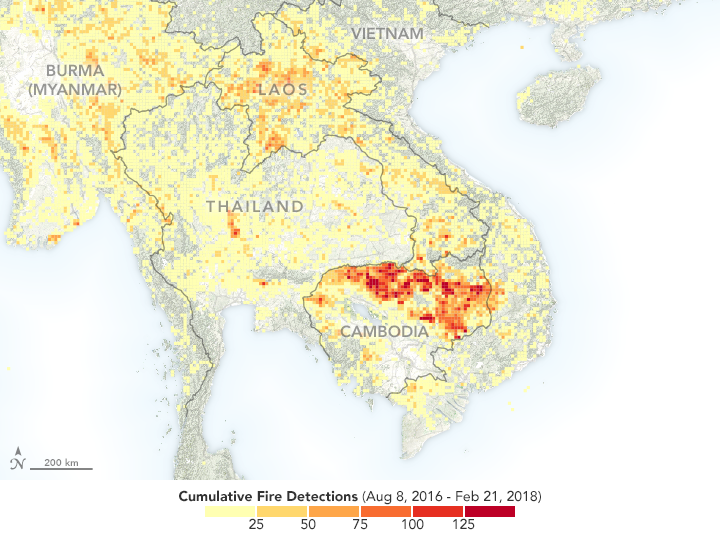 The pattern is consistent with recent years: As depicted in the map below, the instrument has detected four-to-five times as many fires in northern Cambodia as it did in Vietnam and Thailand between August 2016 and February 2018. Northern Laos also had a relatively high number of fires. People light fires in Southeast Asia for several reasons. In some forested areas, small-scale subsistence farmers practice swidden agriculture (also called slash-and-burn). The technique involves cutting down trees and shrubs, letting the wood dry out for a few months, and then burning it to clear fields. Hunters sometimes start fires to drive reclusive animals into view. Likewise, people collecting mushrooms sometimes burn the forest floor to make it easier to forage. Loggers use fire to clear roads and to clear the land after harvesting the most desirable species. In non-forested areas, farmers set fires to dispose of plant debris after harvesting rice, wheat, and other crops. Discarded cigarettes, sparks from vehicles, and problems with electrical systems also spark fires. 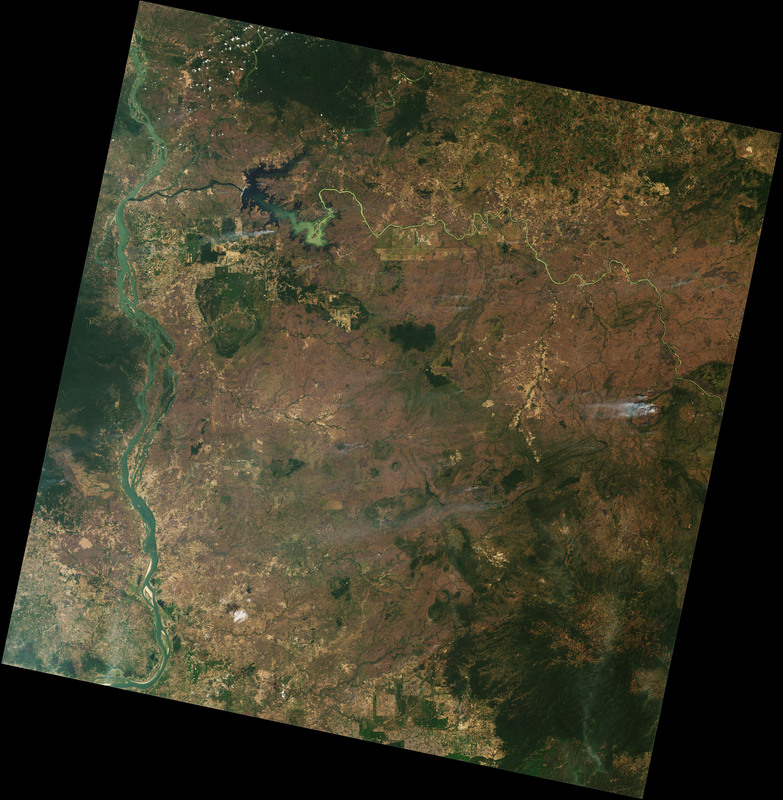 The natural-color image (below) was acquired by the Operational Land Imager (OLI) on Landsat 8 on February 1, 2018, and shows fires burning in shrublands near a forested ridge in the Srepok Wildlife Sanctuary. 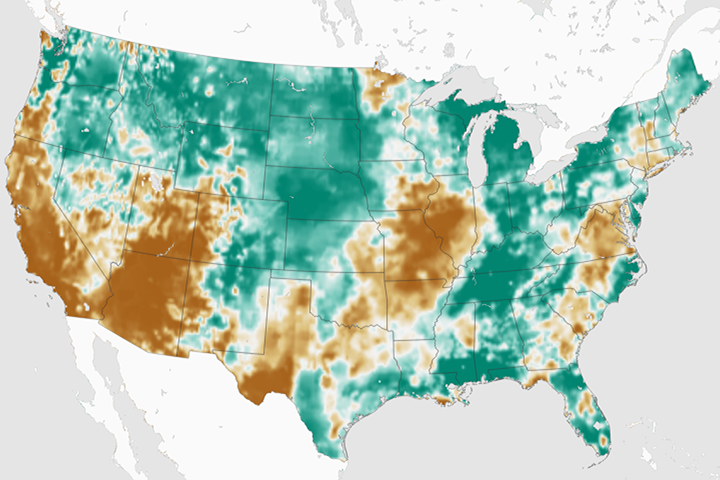 Data collected by Landat’s Thermal Infrared Sensor (TIRS), overlain on the images in orange, shows where the sensor observed unusually warm land surfaces. There are several reasons fire gets started in this particular area. Occasionally, lightning ignites dried vegetation. People use fire to harvest a prized type of resin from Dipterocarp trees and honey from bee hives. Sometimes those fires escape and spread. Timber harvesting is a known practice in this area, although the government of Cambodia has launched a campaign to stop it. The effects of all of these small fires can add up in other ways. With populations rising and the amount of farmland increasing, fires in Southeast Asia (including Indonesia and Papua New Guinea) are thought to be responsible for at least 10 percent—and likely significantly more—of global wildfire emissions, which can cause health problems and add greenhouse gases to the atmosphere. 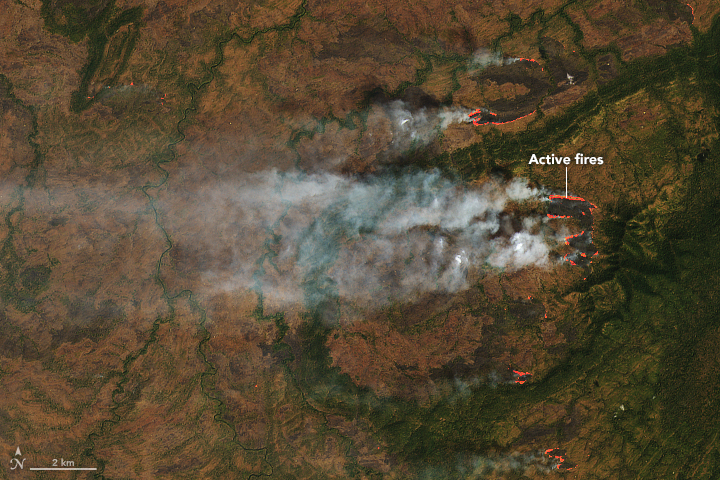 NASA Earth Observatory images by Joshua Stevens, using fire data from the VIIRS Active Fire team and Landsat data from the U.S. Geological Survey. Story by Adam Voiland. 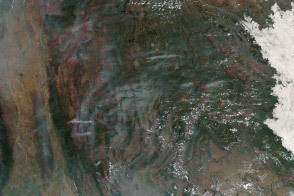 The Suomi NPP satellite detected especially high numbers of fires in Cambodia. Agroforestry World (2015, March 15) Less swidden agriculture in Southeast Asia: effects on livelihoods and ecosystems. Accessed February 27, 2018. Environmental Investigation Agency (2017, May) Repeat Offender: Vietnam’s persistent trade in illegal timber. Accessed February 27, 2018. Hurni, K. et al, (2016) Mapping the Expansion of Boom Crops in Mainland Southeast Asia Using Dense Time Stacks of Landsat Data. Remote Sensing, 9 (4), 320. Li,P. et al, (2014) A Review of Swidden Agriculture in Southeast Asia. Remote Sensing, , 6 (2), 1654-1683. Lasko, K. et al, (2017) Satellites may underestimate rice residue and associated burning emissions in Vietnam. Environmental Research Letters, 12 (18), 085006. Luu, H. & Pinto, F. (2014) Dipterocarp oleoresin in Vietnam and Cambodia: harvesting techniques, resource management and livelihood issues: A report from an exchange visit to Cambodia. Accessed February 27, 2018. The Diplomat (2017, October 30) The Difficult Discussion on Cambodia’s Forests. Accessed February 27, 2018. The Phnom Penh Post (2016, February 9) Blazes seen across Kingdom. Accessed February 27, 2018. The Phnom Penh Post (2017, May 1) Logging ban flouted as Vietnamese nationals strip protected forests in Ratanakkiri. Accessed February 27, 2018. Radio Free Asia (2016, January 19) Hun Sen Creates Committee to Tackle Illegal Timber Trade in Cambodia Accessed February 27, 2018. Reuters (2016, February 25) Cambodian PM tells troops to fire rockets at illegal loggers. Accessed February 27, 2018. The Wildlife Conservation Society (2012) A wildlife survey of southern Mondulkiri province, Cambodia. Accessed February 27, 2018. University of Maryland VIIRS fire map. Accessed February 27, 2018. Van der Werf, G.R. et al, (2010) Global fire emissions and the contribution of deforestation, savanna, forest, agricultural, and peat fires (1997-2009). Atmospheric Chemistry and Physics, 10, 11707-11735. Vadrevu, K. et al, (2014) Spatial Variations in Vegetation Fires and Carbon Monoxide Concentrations in South Asia. Remote Sensing Applications in Environmental Research. Vadrevu, K. et al, (2017) Land cover, land use changes and air pollution in Asia: a synthesis. Environmental Research Letters, 12, 120201. World Wildlife Foundation (2018, January) Eastern Plains Landscape case studies show unrelenting illegal activities, but successful interventions amidst wider national crack down. Accessed February 27, 2018.